The City of Daytona Beach is committed to providing quality recreational programs for people of all abilities. In addition to various activities and classes, we currently offer therapeutic recreation programs such as Camp T. Rec, The Young Adult Club (YAC), BlazeSports Club of Daytona and Daytona Wheelchair Sports. Therapeutic Recreation is more simply defined as play with a purpose. It can be offered in a number of settings including hospitals, skilled nursing facilities, retirement communities, schools, mental health and drug treatment centers, abuse shelters and municipal or county recreation agencies. Therapeutic Recreation is important for many reasons. It has many purposes that assist individuals through promoting greater self-reliance and developing essential skills for independent living. Recreational activities can be used to improve physical abilities including muscle strength, balance, coordination, flexibility, mobility and range of motion. These activities help to build self-esteem and self-confidence by focusing on the individual’s strengths, further developing these skills through physical activity or by providing opportunities for self-expression and creativity. Therapeutic Recreation aids in strengthening interpersonal skills by encouraging individuals to join in activities that nurture social relationships and create a feeling of group acceptance. In addition, Therapeutic Recreation promotes stress management through activities that relax the mind and body. As a whole, Therapeutic Recreation offers recreational opportunities for people of all abilities. This social club for young adults ages 17 and above with intellectual disabilities addresses the socialization desires of these young adults. Members are offered the opportunity to give input regarding the activities they wish to partake for our bi-weekly evening gatherings. Gatherings are generally between the hours of 6 to 8 pm, at various locations within our community. Each club member receives a monthly activity calendar. For more information, contact Anthony Murphy at (386) 671-3565. This club offers beginner to intermediate level athletes with physical disabilities opportunities for training in tennis. Participation is open to athletes 13 years of age and up. 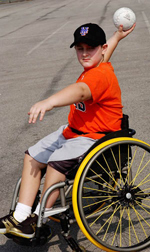 Our youth sports component offers young people, ages 7 to 12, with physical disabilities the opportunity to participate in our athletic programs such as baseball and buddy ball.